Boerboels or more commonly known as the South African Mastiff is a dog breed that is known for guarding homes. They are one of the most powerful breeds of dogs and they are also used by farmers. In fact, the word “boer” is the Dutch word for farmer. You can read more about them in this link here. The Boerboel has a very strong bone structure, blocky head, well-developed muscles, and a short length. 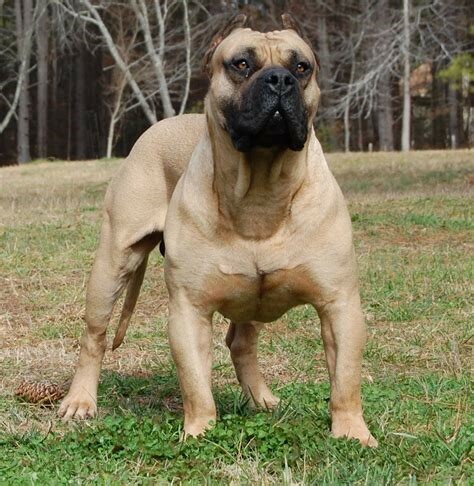 The male Boerboels are more balanced and bigger than the female ones. They are very easy to groom and an occasional monthly trim is all they need. The coat is coarse, shiny, soft, smooth and short. They are intelligent, charming, and loyal. They are also great with children. Dogs play an important role in many homes. They are treated as trusted companions and they are one of the best additions in a family. They also reduce stress and improve the health of many people. They can act as a friend or a guard inside a home. With the importance of dogs inside the home, the South African mastiff Boerboel has garnered a lot of attention lately. Read more about dogs in this link here: https://www.collinsdictionary.com/dictionary/english/dog. The Boerboels are not so choosy when it comes to food. Some high types of breeds are content with regular dog food. As long as they have premium ingredients and they were recommended by a veterinary, then the mastiff will be fine. As an owner, you should also watch for your dog’s weight level and calorie consumption in order to make sure that they stay healthy. Due to their large size and aggressiveness when not trained, Boerboels are one of the best guards inside your home. They will not let any intruders inside your home easily. You can rest easy at night knowing that a large guard dog is keeping you and your family safe. In South Africa, some of the predators that they can drive away are leopards and baboons. You can choose the breed of your puppy at sites like Elite Boerboels and see them in person. They can act quickly despite their large size. Aside from the agility that they possess, they are also known to have lots of courage. This makes them the perfect guard dogs for many families. Their ability to track is one of the reasons why many people want them to be their guard dogs. They are best used as hunting companions since they are able to track their prey in no time and return to your side without consuming the prey. Boerboels are easily trained. They are also loyal which makes them one of the most easily trained dogs in the world. They can learn tips and tricks easily which makes them convenient guard dogs in the shortest possible amount of time. Unlike with other mastiffs, the South African Boerboel is great with children. They can be considered as pets when they are inside the household. Other mastiffs need to be leashed and avoided by other family members. The Boerboels are different. They are fierce protectors, aggressive and they have a bad temperament but you can trust them to guard your territory effectively. Some people do not go with mastiffs because they tend to contract diseases. They also have short life spans. This is quite the contrary to the South African Boerboels. They have great weight, and they are very healthy compared to other mastiffs. These pets are one of the gentlest members of the family if they are well-trained. They can be good house pets and they don’t pose a threat to other pets of the family. They can share their food whenever the need arises. Boerboels are very lazy house pets. But when they are in the mood, they have a high level of energy. Since they have high levels of intelligence, they can identify which ones are friends and which ones are strangers. However, make sure that they are not playing with small children. Their fur coats are short. When they are in the mood for a mud bath, a quick dip is all they needed when they want a quick dip. Some of them can be trimmed and groomed once every month. Since most mastiffs are aggressive in nature, most people hesitate to make them as guard dogs. This is a different case with the Boerboel. When they are properly introduced to a visitor, they can recognize their faces instantly. They are easy to teach and they can easily welcome visitors when their owners train them to. Before you get Boerboels, make sure to do your research first. You also have to know the reason why you are getting them in the first place. If this is your first time getting a Boerboel and you want to make them as household pets, make sure that they are trained first and they have high-quality breeds. These dogs can be one of your best friends that will protect your home day and night. If they are handled correctly, you will be able to make them follow your orders and be friendly with your families and friends. You can contact an expert today about Boerboels to know more about them.